Error handling. Rich text editing. Assignment 8 hands-on. This section suggests an approach for gracefully handling request errors in an ASP.NET MVC web app. Inspiration for some of this was suggested by this StackOverflow answer. 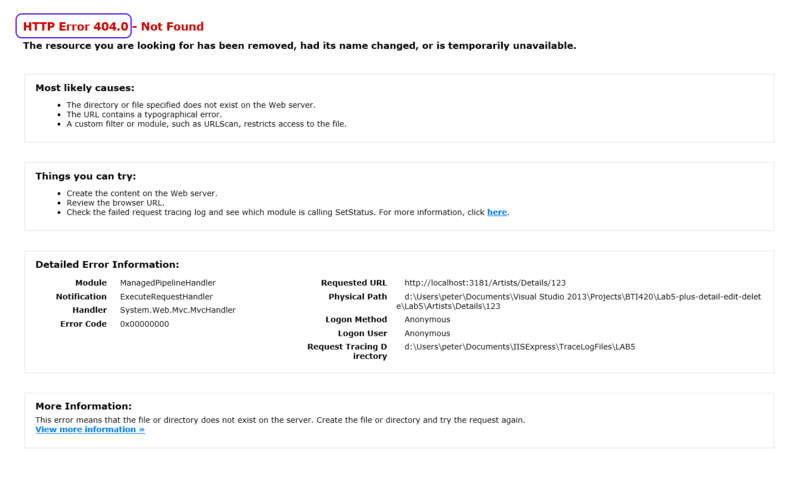 The first error – HTTP 404 – happens when a requested resource does not exist. Click the image to open it full-size in a new tab/window. Writing a suitable 404 page can be a serious yet amusing undertaking. This solution will be added to a future project template. Here’s how it works. Here’s some suggested code. We will use the ViewBag property to easily pass simple data to the view, and avoid the need to create view model classes. While there many be multiple instances of MvcApplication running, the Application_Start()method runs only once at the beginning of the app’s lifetime. If you are using the MvcApplication class to initialize global (to the app) state (e.g. data, resources), be careful. Do the research. Make sure that you use the different kinds of app state storage appropriately. Recognize what kind of app state storage is global to the app (e.g.application state), and what kind of app state storage is local to a specific instance of an MvcApplication class (e.g. class-level properties and fields). Your professor will guide students as we get started on Assignment 8. This assignment has a two-week lifetime. It is due on March 31 for sections B and C, and on April 3 for section A. Today, before you leave the room at the end of the time slot, ensure that you give the Work Report to your professor, for the in-class grading part of the assignment.